Thank you to California Almonds for partnering with me on this post. When you live a busy life, it can be hard to fit everything into your day. As well as running my blog, I work in the evenings for an email marketing company, and I coach a high school dance team three days a week. Let’s just say I’m a busy bee. Most of my days look different as I’m either at my desk writing, on a call, driving, talking with customers, or coaching the dance team. I have to be really on top of my schedule in order to fit everything in. In addition to work, staying on top of my health is really important to me. I’m always thinking about what I’m going to eat and if I’ll have time for the gym or self-care at the end of the day. 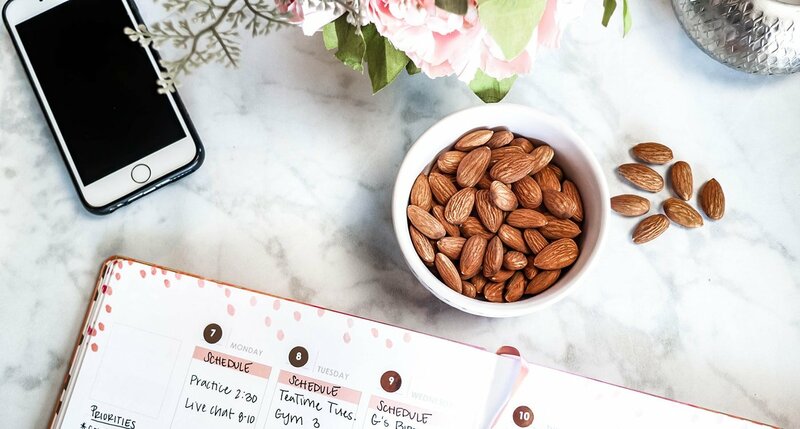 When you have a busy schedule, it can be hard to fit everything into your day. Skipping meals or running errands instead of taking time for lunch might save time, but it leaves you feeling tired and hungry. Today, I’m sharing how I find balance in my life by making time for healthy habits, self-care, and nourishing food. Keep reading if you want to learn how to find a little more balance in your life! I’ve always been the type of person to keep myself busy. These days, I’m balancing my time between three jobs which is rewarding and overwhelming at the same time. I never imagined myself doing so many different things, but sometimes life works in weird ways. Because my schedule isn’t always predictable, it can be hard to fit everything into my day. I know I have to plan ahead in order to get anything done, and I also have to use my time in the most productive way. I’m a huge fan of time-blocking my schedule and using the Pomodoro Technique to beat procrastination. (Basically, the Pomodoro Technique is a system of time management that breaks down work into short intervals.) 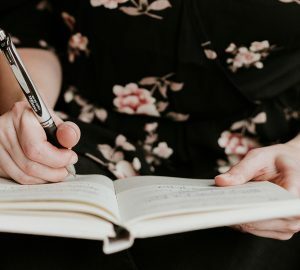 Of course I have my unproductive moments, but I’m definitely someone who thrives on getting things done. Even though my work is important to me, my health is equally as important. After all, I know that I can only do my best work if I have the right amount of physical and mental energy. We all know burnout is real, and I think it happens when we let our schedules get in the way of making healthy choices. When you’re running around all day trying to get things done, your health is most likely to get put on the backburner. That’s why I make it a priority to practice self-care and making healthy choices for myself. Since I’m always working on something, I need sustained energy to keep me going or else the hunger will start to kick in (and no one wants that). I personally believe a big part of self-care is making healthy choices when it comes to food. That’s why I always make sure to have a snack in my bag for times when I don’t have time to think about my food choices. 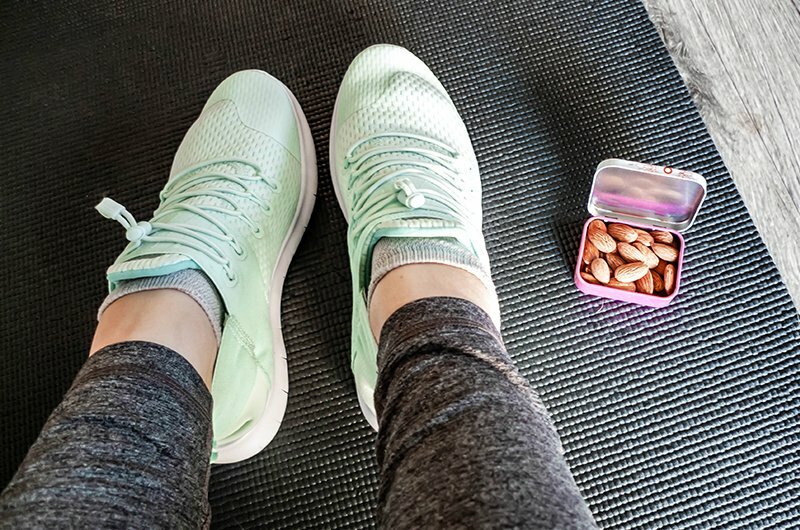 Instead of opting for the snack that will only make me crash later, I pretty much always make sure to have almonds in my bag. 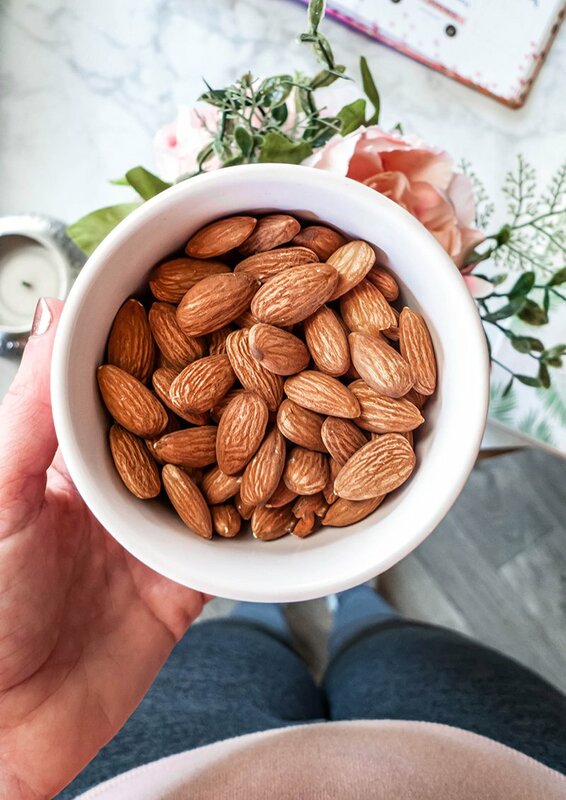 Almonds are such a quick, convenient and delicious option for those of us who juggle numerous priorities and need sustained energy. 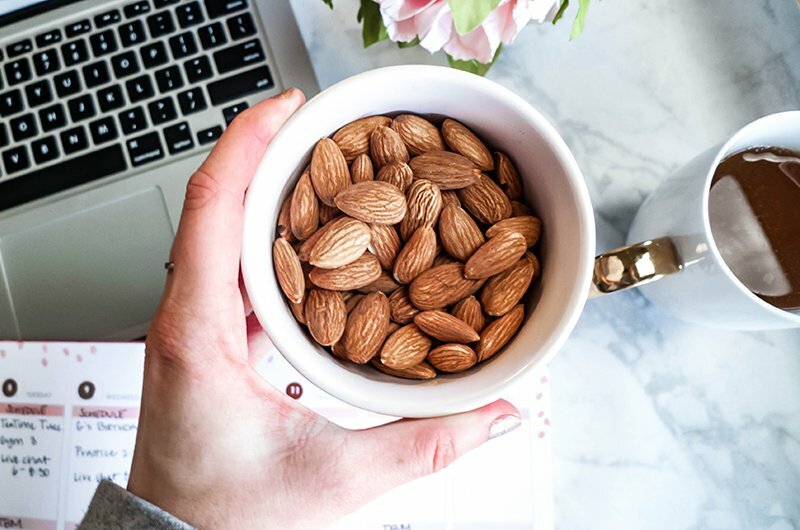 I personally love snacking on almonds in the morning when I’m at my desk and working on my blog, or I’ll enjoy them in the afternoon while I’m at practice coaching my team. 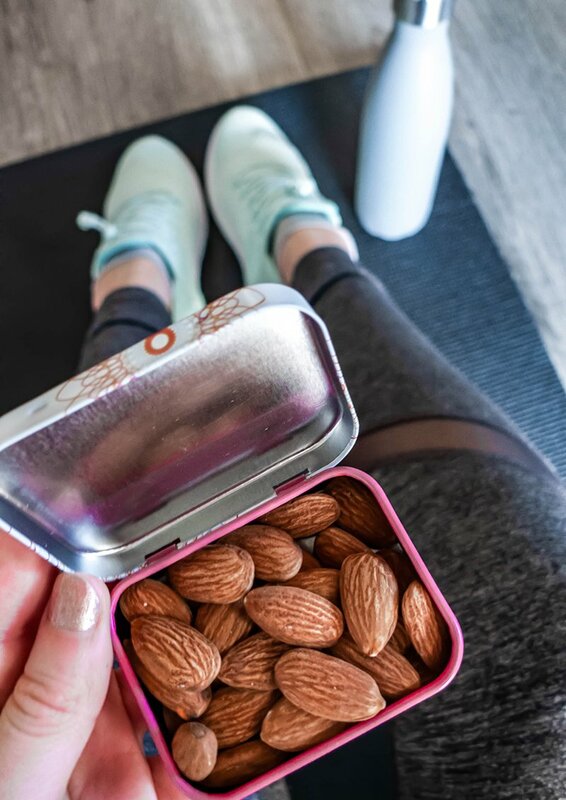 Almonds are the ultimate productivity sidekick because they provide sustained energy, and you can literally take them anywhere with you. 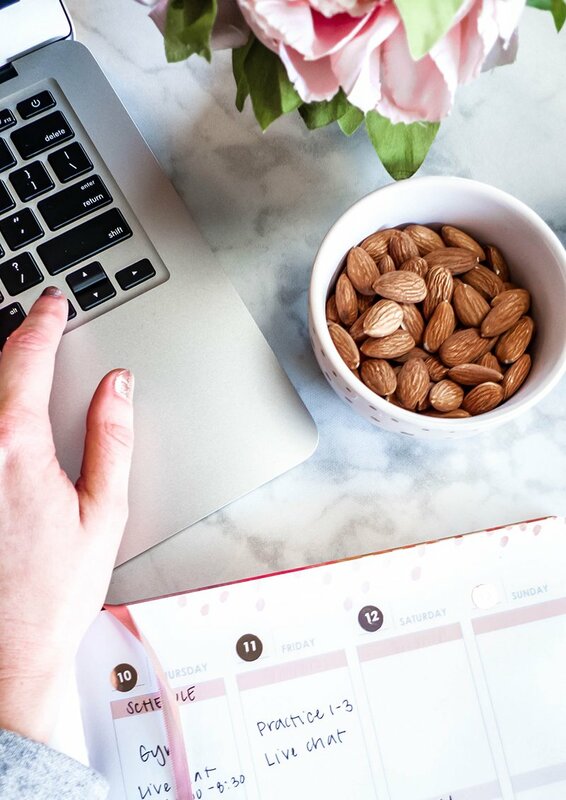 Instead of falling into the convenience trap at work, I encourage you to opt for foods like almonds that will keep your focus and energy levels up. When it comes to healthy eating, you want to make sure your environment is set up for success. 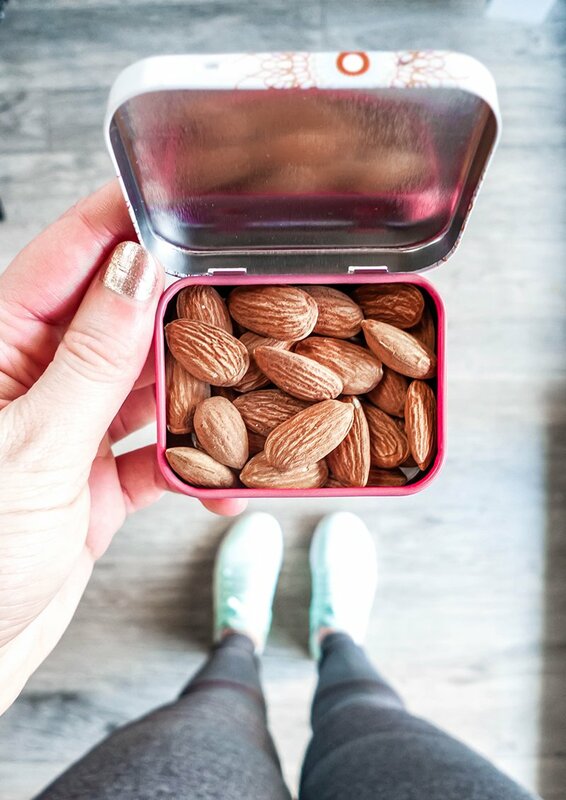 If you’re on the go often, it might be that you need to keep some emergency supplies like almonds in your bag or car. 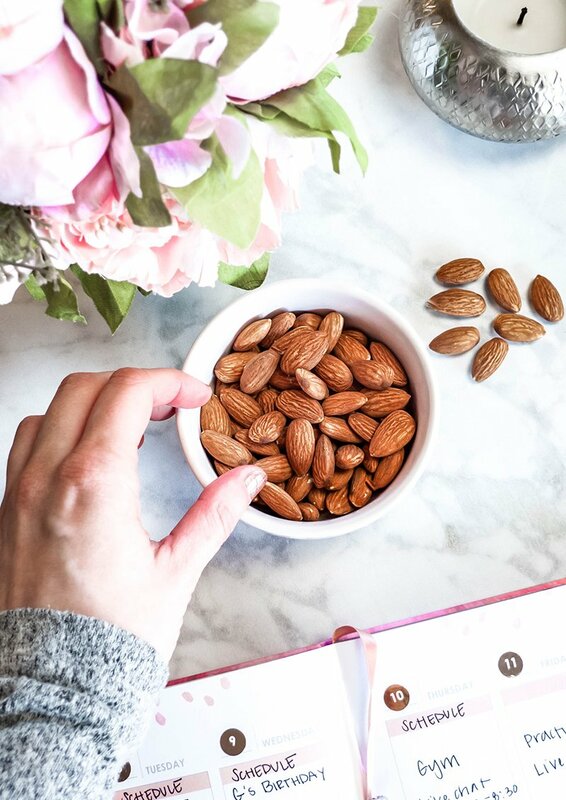 Almonds are super portable and a good source of fiber and protein, so keep some on you for emergencies. In terms of meals, it helps to plan your meals ahead of time and batch cook them on a Sunday. That way, you won’t have to worry about what to make when you get home late from work. Search for quick and easy recipe ideas on Pinterest and plan your meals out from there. Just like your food choices, it’s important to keep your workouts as simple as possible. Keep your favorite workout videos bookmarked online or write down a simple workout in the notes app of your phone that you can do wherever you are. You basically want to eliminate all decision-making involved when you’re trying to squeeze in a quick workout. If you don’t have time for a workout, opt for moving whenever you can. Whether it’s taking the stairs, walking to your meeting instead of getting a cab, or standing instead of sitting, make moving your body a priority. 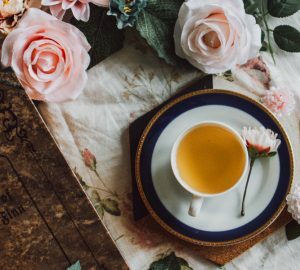 If you’re going non-stop from the early morning until nighttime, you might not feel like you have time for self-care. 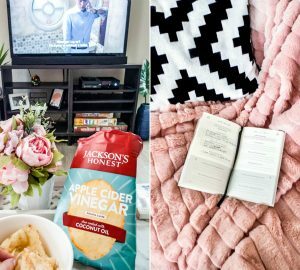 The good news is that self-care doesn’t have to be super elaborate. You just need to take advantage of the little breaks you get in between everything else. See what you can fit into the ten minutes of downtime you get every now and again. It can be tempting to use this time to scroll through social media, but it will be more beneficial if you do some squats, meditate, read a book, or go for a walk. I love emojis and almonds, but unfortunately there’s no almond emoji yet. 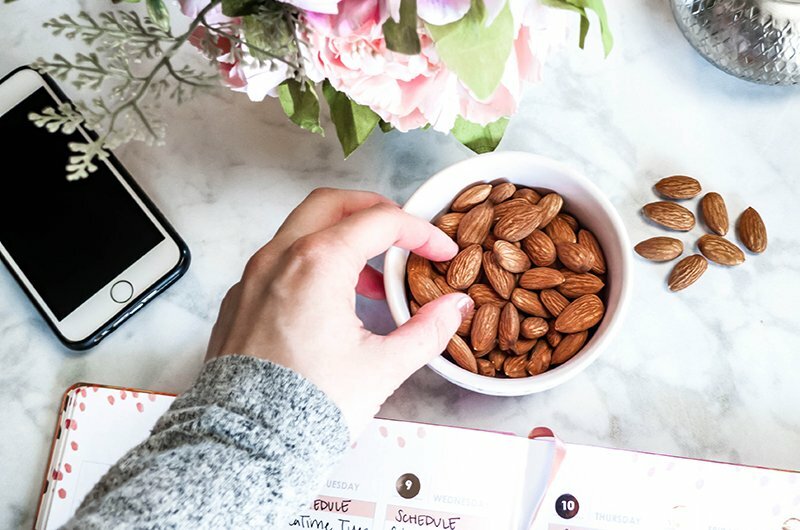 Avocado and taco lovers get their own emoji, but what about the almond lovers of the world? 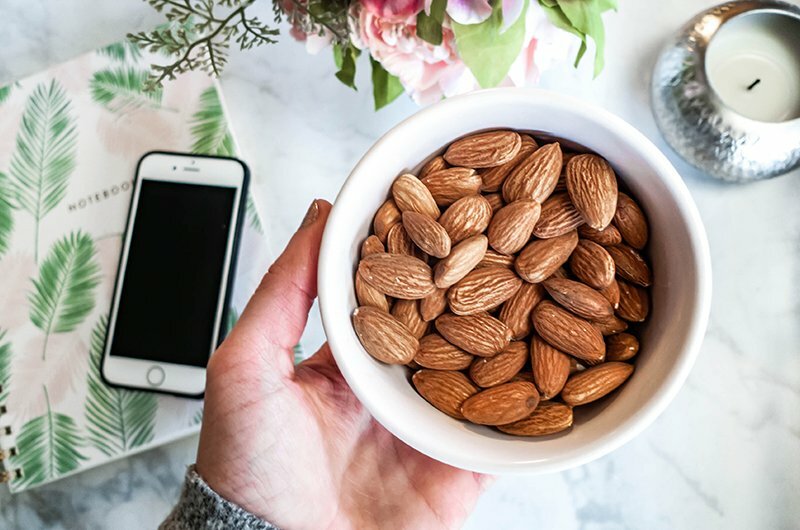 Let’s get an Almond Emoji that we can use all over social media – sign the petition here if you’re with me! How Do You Make Time For Healthy Habits? 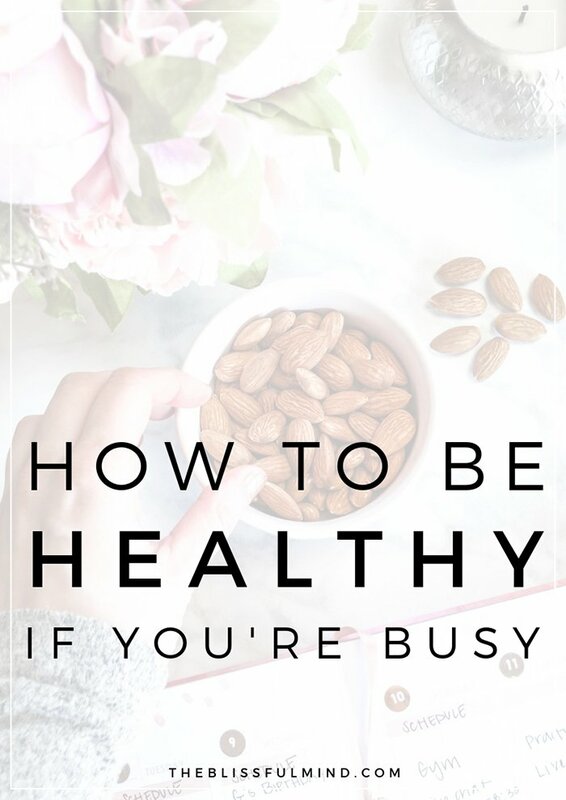 I hope this post has given you some helpful tips for staying healthy and balanced when you’re busy. 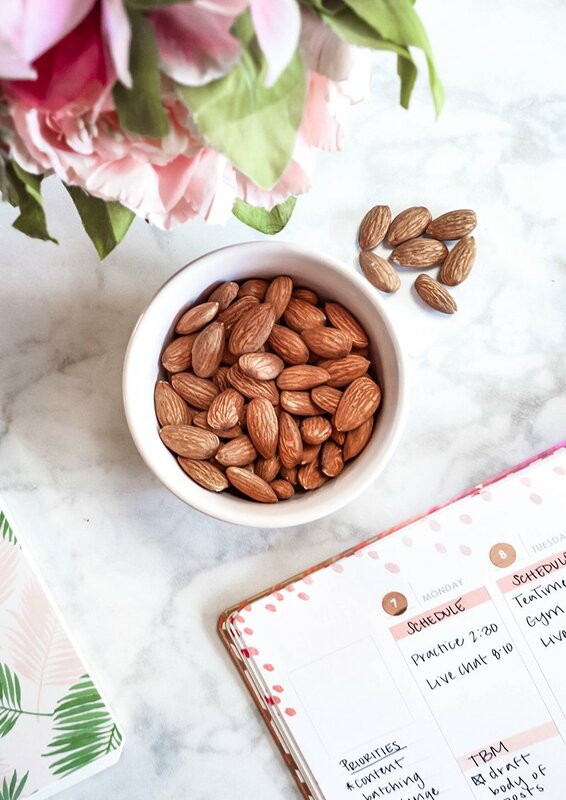 Planning ahead is one of the best things you can do for your health, and so is keeping a handy snack like almonds in your bag while you’re on the go. 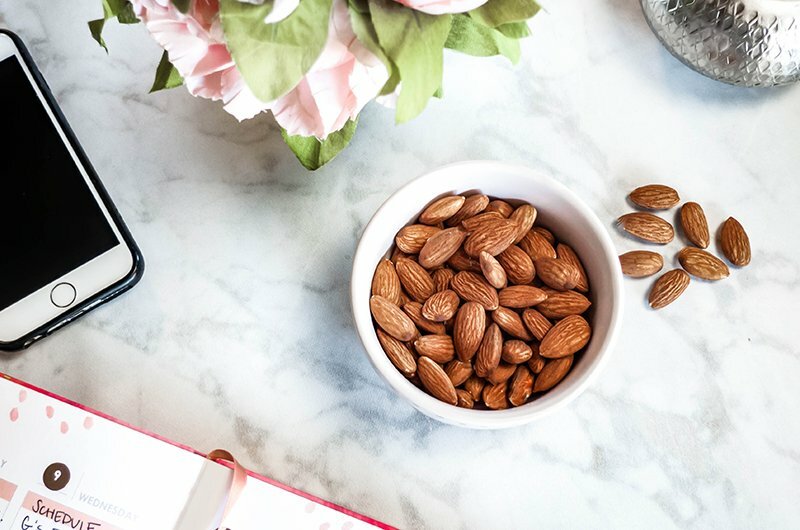 If you’re an almond lover like me, remember to sign the Almond Emoji petition here! This is a sponsored post written by me on behalf of California Almonds. This was a really helpful post. I also think physical health is a key component to good mental health. Thank you for sharing! Absolutely! Exercise is important for so many things. Thanks for reading, Nichole. This post is a reminder of the old adage “health is wealth”. Many thanks for sharing! Oh yes, 100%! Thanks for reading, Anna. I really agree that when you’re too busy to fit in any actual workouts, just making sure you’re moving as much as you can in your everyday life really makes a difference. If I just sit still all day for example I know that makes my mental health take a dip as well. Yes, totally! I think we tend to push it aside if we can’t work out at all, but there are so many ways to get in a little bit of movement with whatever you’re doing.